If you’re trying to figure out whether to use ghee or butter, and you go online looking for information, you’ll easily find a million posts arguing that ghee is superior. Fair enough—I’m a big fan of ghee. But I’m also a big fan of butter. And I don’t think you should always use one rather than the other, no matter what the internet says. I love them both, I use them both (for different things), and as long as both are grass-fed, I’m a fan. So before you throw out all your butter and start using ghee for everything, let’s dig down just a little deeper into what these two foods do—and don’t do. What exactly is the difference between them anyway? What exactly is ghee, anyway? But that’s kind of like forcing rival gang members to socialize by holding a gun to their heads. They don’t like each other, and once you stop forcing them to, they’re going to get as far away from each other as they can. Stop shaking the jar, and after about two minutes, this is what happens. 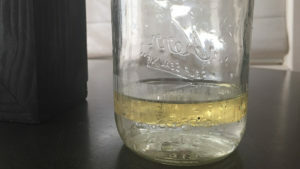 Notice how the oil is already starting to separate and float back to the top? And a couple minutes later, it looks the same as it did before you shook it. Unless you add an emulsifier to the mix. The emulsifiers in butter are the milk solids and milk proteins (like lactose and casein). When you remove the milk solids, and water, you’ve got ghee. 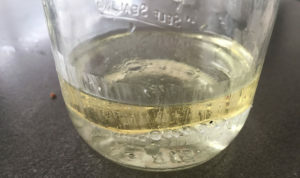 Ghee is really just an uber-clarified butter; all the milk solids and proteins, any sugar, and all the water have been removed leaving, really, only the fat. The wonderful reputation of ghee is mostly deserved; but the terrible reputation of butter is not. Ghee gained its reputation as a health food in India, where it is traditionally used for… well, just about everything. It has a long and respected history as a medicinal and healing food in Ayruvedic (Indian) medicine, a tradition that dates back nearly 5,000 years. 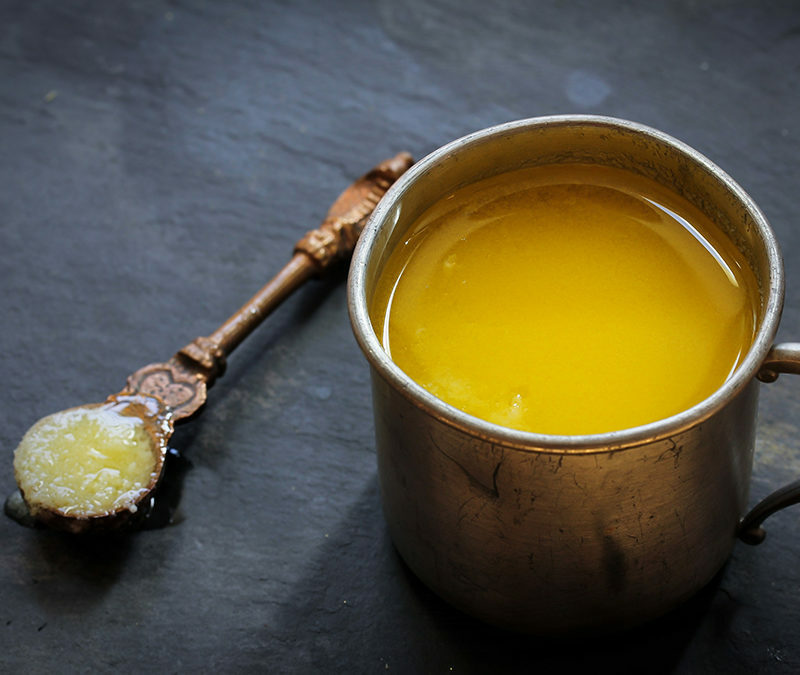 Ghee is believed to strengthen the ojas, the vital energy cushion at the root of our well-being and immunity. It doesn’t need to be refrigerated, and is great for cooking. What’s not to like? Meanwhile, poor old general-purpose butter has been taking a drubbing for the past forty years as a result of the ill-informed and (hopefully dying) low-fat movement, which demonized this wonderfully healthy food ever since Ancel Keys convinced everyone that saturated fat causes heart disease, back in the mid 1980’s. But don’t get me started. There are hundreds of articles listing the health benefits of ghee. 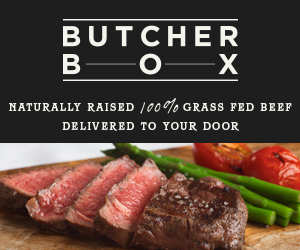 If it comes from grass-fed cows, it has CLA— conjugated linolenic acid — a natural fat which has anti-cancer activity. Ghee also has the vitally important vitamin K2. In fact, ghee has a number of fat-soluble vitamins, including vitamin A.
You’ll also find a ton of people proclaiming it’s spiritual benefits (I’ve even read that it’s a “spiritual butter”). All this may be so, but it’s a little more subjective and more about ghee’s hallowed status in Ayruvedic medicine. But here’s the thing. Grass fed butter also has CLA. It also has vitamin K2. And it also has soluble vitamins, like vitamin A. In fact, very nearly all the nutritional benefits usually listed for ghee are also true for butter. Yet, there are some significant (and some insignificant) differences. There are an awful lot of claims that ghee is superior to butter for heart health. But when you dig deeper, every single one of these claims is based on what ghee does to cholesterol levels. And it is true that there is some research that shows that ghee eaters have higher HDL and lower LDL than butter eaters. Is this significant? I personally don’t think so. Cholesterol is a lousy predictor of heart disease—more than 50% of people admitted to hospitals for cardiovascular disease have perfectly normal cholesterol. But if cholesterol is your concern, ghee is probably a better choice than butter. However, there are three differences between ghee and butter that I do think are important. 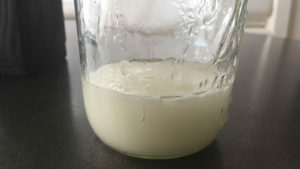 When you make ghee, you remove all the stuff in dairy that people are sensitive to—like casein, lactose. All that’s left is the fat, and that’s not what causes allergies or sensitivities. So for people who can’t eat any dairy products, ghee is the perfect choice. This last difference is pretty subjective. Personally I don’t like ghee in my high-fat coffee. I prefer a hint of buttery taste. On the other hand, ghee offers a wonderfully neutral flavor that cooks love cause it blends beautifully with foods and never overshadows. Disappointing thought it may be for the many of us who like clear winners and losers, there’s no clear answer. I think it’s a toss-up. But let’s not throw out the butter just yet. If you have no dairy issues, and you’re cooking at moderate heat, or looking for something to melt on your sweet potato or your rice cauliflower, I see absolutely no reason to avoid high quality grass-fed butter. On many counts—vitamins, CLA, etc— it’s just as good. 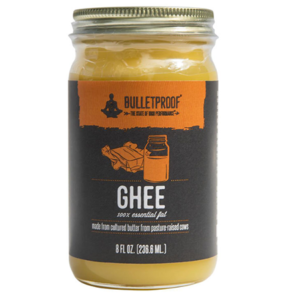 If you would like to try the Bulletproof Ghee– don’t forget to use my special coupon code jonny to receive 10% off. Very interesting article. But I do have one really important question, particularly for women. Years ago, my doctor has warned me that it is imperative, I never ever take any kind of hormone replacement pill. He knew I was moving, and would be getting a new doctor. I have read that butter has 11x the estrogens and 14x the progesterone as milk, and now that dairy practices have increasingly been utilizing milking during late stages of cow’s pregnancy, the hormone levels will be rising. Should women be eating ghee or butter, particularly if she has heightened risk due to BRCA gene etc? Also, have read that saturated fat also increases risk of breast cancer, by nearly 20%. Do you know if it’s true that the high heat processing used to make ghee damages (oxidizes) the cholesterol? I think I remember reading that in one of Kilmer McCully’s books. 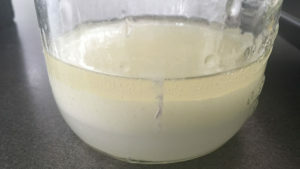 Hi Jonny, how is ghee clarified? If by using heat, wouldn’t all the heat have oxidized the fat? I am curious because every time I eat ghee balls (an Indian delicacy which I absolutely love) I get mouth ulcers. Would love to hear your thoughts on this, as well as to Deana’s queries above (which I find should be useful for many health conscious readers). Thanks!